Do you need to increase your brand or your profile awareness, considering the best times to post on social media? Several studies, so far, show how to properly plan your posts, according to your time zone and your target audience. So, your content can get higher engagement and more traffic is directed to your blog. However, before I move on to more details, it is important to rule out one common misconception. Contrary to popular belief, the number of people online on a certain social media network at a given time are not the biggest determinant of how well a post would do, in terms of likes and traffic generated. So what is the magic trick then? Well, there is a different one for each social media channel, but here are a few general guidelines and tips for you to begin with. Firstly, different time zones must be considered for the best times to post on social media. As for U.S.A., 80% of the population resides in the Eastern and Central Time Zone combined. So, it would be ideal for people of U.S. to post, according to these two time zones, if the goal is to reach a greater number of people via social media shares. If you’re not in the U.S. – do not fret. We have a solution for you too. There are a couple of Google Analytics Custom Reports, which you can use to figure out when it would be best for you to post on your social media. As the name suggests, it customizes the results according to your time zone and your audience. 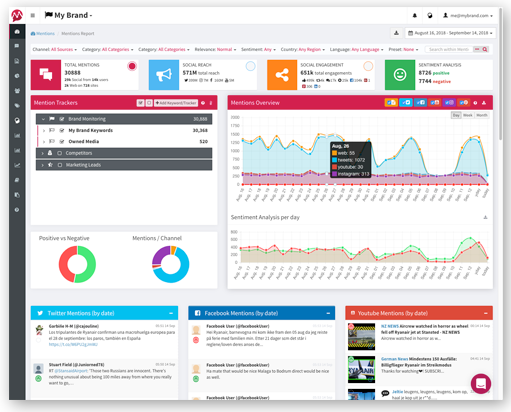 Further, some tools help you determine when your audience is on the network, so you can choose your own perfect time to upload your posts and content. But more on this later. 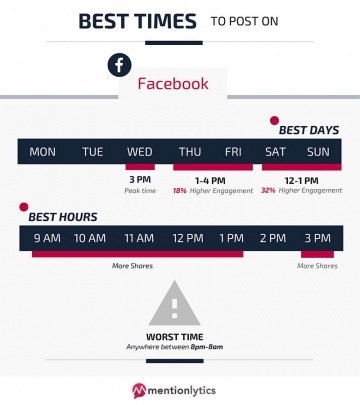 So, what are the most popular times to post on social media? 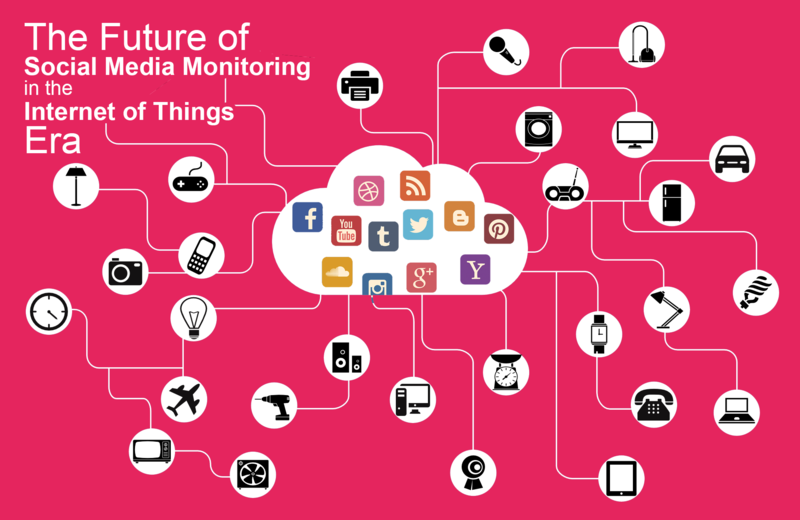 For now, let’s focus on Facebook – one of the most popular and used social media platform. The short answer would be to aim at posting between 12-1 pm on Saturday or Sunday, or 1-4 pm on Thursday and Friday, or 3 pm on Wednesday. If you’re aiming at a higher number of shares, your safest best is to post at 9 am, 1 pm or 3 pm. 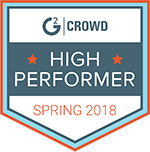 Now onto more details: according to Quick Sprout, engagement is at the highest during Thursday and Friday, whereas Monday, Tuesday, and Wednesday faces a 3.3% decrease in engagement. Since people are generally happier on Friday (because weekend and no work, duh), humorous content will tap into that happy feeling and secure more likes. So, the best time to post on Friday is really important. Neil Patel suggests posting at 1 pm if you’re looking for a bigger number of shares and 3 pm if you want more clicks. Content that is shared from 9 am to 7 pm will always do better than if posted outside this time bracket. In addition, Elle & Co. suggests 1-3 pm as the perfect time, while SurePayroll warns us to not post before 8 am and after 8 pm on weekends. According to this study from unmetric on brands and personalities FB postings, even though brands were more likely to post between 12-1 PM, they received the highest amount of interactions on their posts published between 10-11 AM. At Fast Company, they recommend 3 pm on Wednesday as the ideal time, whereas at Huffington Post they believe Thursday and Friday are better days to post on Facebook and usage of Facebook spikes by 10% on Fridays. It is also recommended to keep the length of your posts to a minimum. Hardly anyone has the time to read essay long posts on Facebook. In this data-driven study from quintly, Sundays seem to be the most effective days, when it comes to the USA brands. Also, if you’re running your own page on Facebook – you can easily click on the ‘Insights’ option and proceed to Posts to see when your viewers are online. Similarly, you can use Fanpage Karma to help you monitor different indicators of performance of your Facebook page. The peak hours that are busiest would be during the workers’ breaks from 5pm to 6pm, while commuting back home, it shows an increase of 181% Twitter users to be on the network. 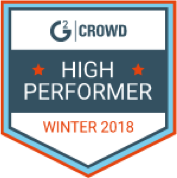 You can use Twitter Analytics and Followerwonk tracking data on your own followers to find the perfect time tweeting, in accordance to your audience’s interaction. In this way, you can help yourself to find out where your followers are located and identify the perfect time zones for the best time to post on Twitter, respectively. 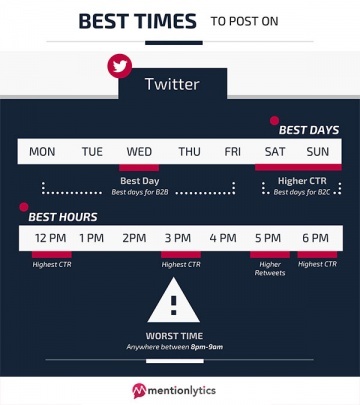 The optimal time to tweet is between 12-3 pm, while 5 pm is the peak time and Huffington Post agrees. Wednesday at noon and 5-6 pm is also considered a good time to tweet and it is recommended to experiment with 2-3 am, 6-7 am and 9-10 pm. Although workdays work better, some types of content is likely to have a larger audience towards at the end of the week. 12pm, 3 pm or between 5 to 6 pm are especially recommended, if you’re looking to increase retweets. Buffer suggests, according to Dan Zarrella’s research that there is a 17% increase in engagement on weekends and Wednesdays work best for B2B audiences, while weekends are ideal for B2C content. They also suggest 5 pm as a good time if, like most people, you’re aiming for a higher number of retweets. According to Dustin Stout, it’s advised not to tweet between 8 pm and 9 am. 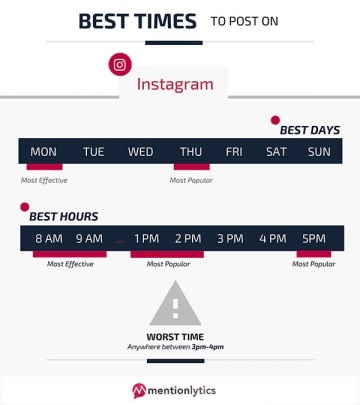 The best days to spot on Instagram are on Monday and Thursday without any specific time, but it is recommended to avoid 3-4 pm. Videos work best between 9 pm to 8 am, while the general ideal times are 8-9 am, 2 am and 5 pm. Instagram audiences are active and engaged throughout the week, but it is observed that Mondays get a little extra attention and Elle & Co. concurs. It is also recommended to upload posts more often during off-work hours as compared to working hours with the exception being of peak times. Apart from these timings, the use of hashtags, emojis and appropriate colour schemes improves the performance of your posts. TrackMaven suggests 9 pm – 8 am as the bests time for videos and picture posts can go up anytime with greater response on Thursday and Monday, whereas MarketingProfs says 1-2pm is the best time to post on social media for a higher level of engagement. According to CoSchedule, however, it’s quite difficult to get traffic from Instagram but if you want to try, try at 2 pm on a Tuesday. 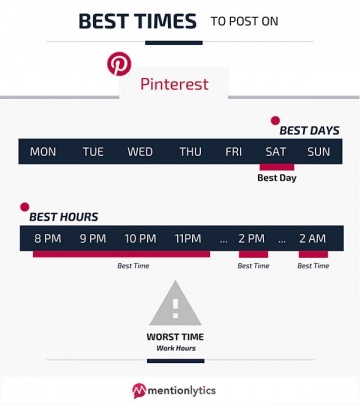 If you’re a user of Pinterest, try posting between 8-11 pm, especially on Saturdays and avoid posting during work hours. For an even more accurate ‘perfect time’, use Pinterest Analytics, which will help you see the best time to post on Pinterest, when you’ve received the most response/clicks and interaction for your Pins. Neil Patel and Elle & Co. agree that the best time to post is 8-11 pm, whereas Quick Sprout suggests Saturdays and SurePayroll agrees that Saturday mornings are the best time to post. Now let’s see the largest professional network, LinkedIn – the morning newspaper for business people. It is ideal if you post midweek from 5-6 pm and even though it’s a professional network, it is better if you post before and after work. However, Neil Patel disagrees and states since it’s a professional network, posts must go up during work hours. 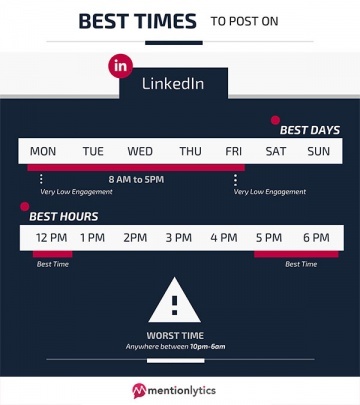 7.30-8.30 am on a Tuesday, Wednesday or Thursday, generally 12 pm and 5-6 pm are considered the best times to post on LinkedIn, specifically Tuesday at 10-11 am. Forbes also recommends to post between 8 am and 5 pm on weekdays for the best response. LinkedIn itself suggests not to post during overnight hours like between 10 pm and 6 am and plan your posts when otherwise occupied professionals have some time to be online and are not resting etc. Like many other networks, LinkedIn also has the LinkedIn Analytics option, whereby you can better understand the particular dates when you’ve reached the highest level of response for the posts you’ve shared. 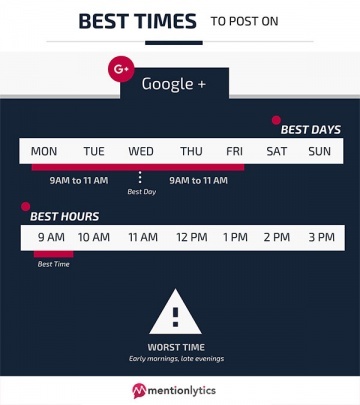 As for Google+, it is recommended to post between 9-11 am especially on Wednesdays. However, it is observed that 90% of the people on Google+ are just lurkers but still, you could use Google Analytics to measure the impact of your content and there’s a specific tool made for Google+ called Timing+ to help you figure out the best time to post on social media to share your content. Finally, it has to be considered HOW each network is used for you to plan your posts and find the best time to post on social media in a better way. For instance, Facebook is mostly used on mobile and desktop, whereas Twitter is more audience-dependent and mostly read during breaks and commutes. Instagram audience could be active any time or all the time, since they’re on a mobile app, whereas Pinterest sees more usage during the evening. As for LinkedIn, it is used close by to work hours but not always during the workday and Google+ sees the highest number of users in the morning.